Select and prepare pH=4.75 buffer. Start Buffer Maker and open new document. There is a frame called Buffer parameters in the left upper corner of the document view. That's where you will enter information about the buffer you want to prepare. Enter 4.75 into the pH edit field. Below Buffer parameters frame there is next frame, called Buffer selection, with buffers list. While you type pH order of buffers on the list changes. These buffers are always sorted according to their buffer capacity. Buffer capacity tells you how resistant buffer pH is to added acid or base. The higher the number, the better the buffer. Buffer of the highest capacity is always at the top of the list. Plot below list shows how the buffer capacity of the selected buffer changes with pH and is described in more details on the buffer design page. Seems like citrate buffer will be most resistant to pH changes. Click its name on the list. Right side of the dialog window changes - it contains names, formulas and volumes of the reagents necessary (masses in the case of solid reagents). Four keyboard strokes and one click - and you are ready for the buffer preparation! If you are not yet satisfied you may now fine tune your needs - change buffer concentration or volume, change concentrations of reagents, enter working temperature or find out how much inert salt must be added to adjust ionic strength of the solution. 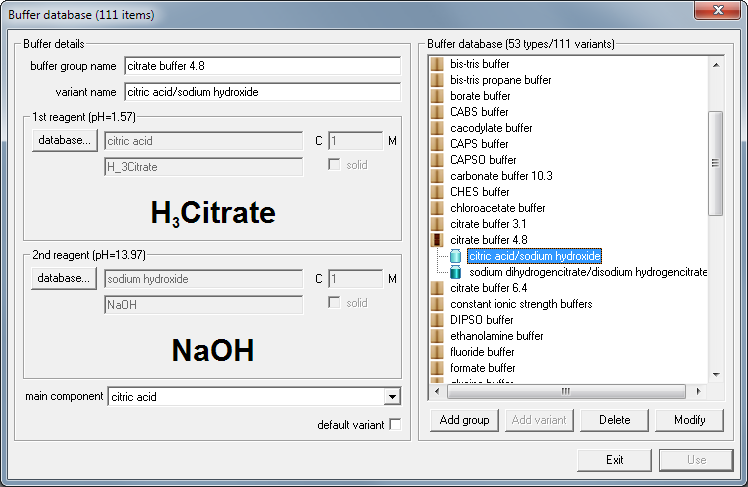 Whenever you enter new value for each of these parameters, Buffer Maker will immediately display new, correct amounts of reagents. 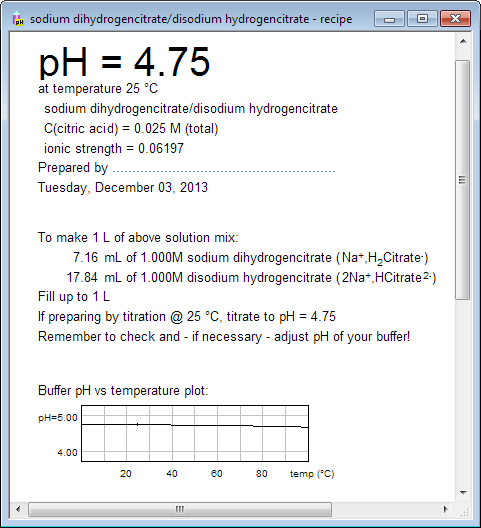 Now click on Use button - and Buffer Maker displays information about how to prepare buffer using pure acid and base. You may think that at pH 4.75 acetate buffer should be the best candidate for the top of the list, but it is not. Citric acid has three dissociation steps and at pH 4.75 each pair of acid and conjugate base resists pH changes. You may treat this solution as a mixture of three buffers, as such it has higher buffer capacity than the acetate buffer, in which only one pair of acid and conjugate base exists. If you want to force ionic strength of the buffer, just check force check box and enter required ionic strength. 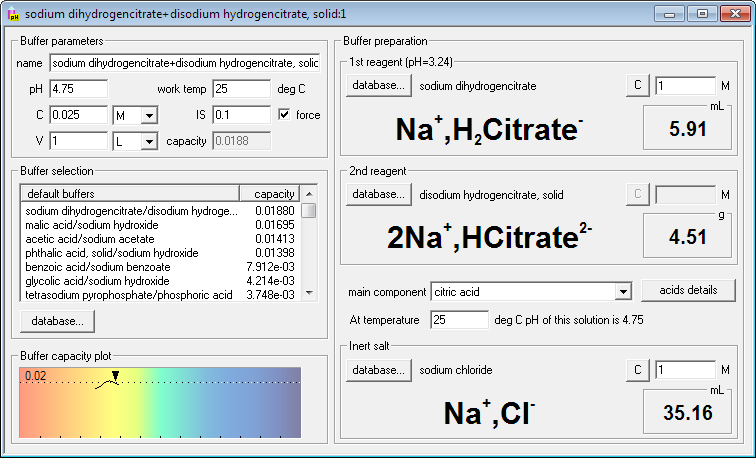 Buffer Maker will automatically select default inert salt (initially NaCl, but that can be changed) and will calculate and display its amount. It will also recalculate amounts of reagents, to account for changed activity coefficients. Just to show you flexibility of the program, we have also changed one of the reagents to solid - and Buffer Maker calculated and displayed mass instead of volume. Note: list of buffers available can be different from shown, depending on the registration and trial version status.